theguardian 10 September 2015: An edible alternative to plastic water bottles made from seaweed has topped the UK round of an EU competition for new, more sustainable products. 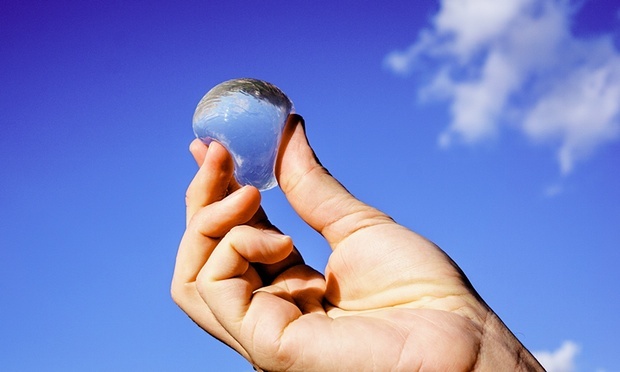 The new spherical form of packaging, called Ooho and described by its makers as “water you can eat”, is biodegradeable, hygenic and costs 1p per unit to make. It is made chiefly from calcium chloride and a seaweed derivative called sodium alginate. Ooho won the joint award with Alchemie Technologie, who have created a digital way of dispensing dye for the textile industry. Clothes are dyed selectively using a product similar to an industrial inkjet printer, replacing the full immersion process used currently, which consumes vast quantities of chemicals, water and...read on.